He is: Father Tom Craig, Director of Propagation of the Faith and Chairman of the Diocesan Mission Council since 2016. 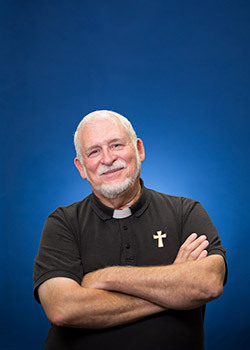 His pastoral service includes St. Vincent de Paul Parish in Arlington, Sacred Heart Parish in Muenster, and St. Catherine of Siena Parish in Carrollton. Ordained: June 26, 1982 at St. Ann Parish in Burleson, where he completed his deacon internship. First call: As a student at Midwestern State University in Wichita Falls, he lost his draft deferment and faced the likely prospect of fighting in Vietnam. So he preemptively joined the Coast Guard Reserves “because their primary mission was to save lives.” His sixth year in the Reserves coincided with his first year in seminary. In the footsteps of Jesus: Fr. Craig enjoys woodworking and builds items from furniture to pens. Mission work: “It’s everyone’s responsibility. If you are baptized, you are a missionary. Our responsibility is to learn and promote the faith, and to pray for others. Meet Father Tom Craig, Director of Propagation of the Faith and the Chairman of the Diocesan Mission Council since 2016. A Coast Guard veteran, Fr. Craig enjoys woodworking and builds items from furniture to pens.